McRae presents herself, on this album and others, as both vulnerable and as a woman that one dare not cross. The audiences who attended her performances were made very aware of any transgression they made, either by a piercing glare or a salty remark. One story tells of a hapless woman who was talking during one of McRae’s songs. In the middle of the piece, without missing a beat, McRae said, “Either you’re coming up here and I’m gonna go down there or you’re gonna let me sing this song.” It is hard to imagine the Divine One or Ella speaking in such a way to an audience member, but royalty, after all, does come in all shapes, sizes and manner. And perhaps this underscores her uniqueness: McRae held court wherever she performed, whether it was a prestigious venue or a club that had seen better days with only one in the audience. “Live at Sugar Hill” is an album that really ought to be in any listener’s collection. McRae had long been paying her dues by singing in nightclubs and other more high profile venues. She also had a healthy corpus of her own recordings in distribution. The majority of these were studio recordings. Much of the material done on those records, according to her longtime pianist, Norman Simmons, was chosen for her by a producer and often handed to her right before she stepped in front of the microphone. “Live at Sugar Hill” is all McRae’s choice of material and what we witness is an artist of the highest order coming into her own. An heir to Lady Day’s legacy, McRae demonstrates her link to Holiday with the opening song, “Sunday.” With some gravel in her voice and a vibrato that appears mostly at the end of phrases, these stylings immediately remind one of her mentor, the great Billie Holiday. But McRae takes these mannerisms further and gives firm proof to the stories of her making the scene with Monk and others at Minton’s when Be-bop was being fashioned: she interlaces scatting with the lyrics and eventually moves into a full on improvised solo–much as a jazz horn player would approach a tune. The lines that she creates are straight out of Be-bop 101 and yet, are completely personalized. McRae does not recite rote licks or patterns, she weaves, ducks and spars, like a prize fighter with the rhythm section, showing her mastery over this very challenging vernacular. Listen carefully and hear a motif she effortlessly creates as she gets into her solo on “Sunday.” With the interval of a whole step, she playfully moves this sequence downward in perfect fifths at the end of the first A section. McRae then blurs the boundaries of the song’s form and mutates this sequence into yet another phrase, ending it a few bars into the second A section. Instrumentalists like Sonny Rollins, Clifford Brown or Dizzy Gillespie for example, often will “play through” the ends of phrases, bleeding over into the next section. This is not a technique for the timid and McRae sounds anything but timid on this recording. Showcasing a range of tempos and the different ranges that she can shift her voice into, provide us with a full resume of McRae’s experience and artistry as a vocalist. “A Foggy Day” is taken at a tempo that would make many instrumentalists blanche. Yet McRae glides through it with aplomb, not exactly sad about the British Museum having lost its charm but simply reporting on the situation. If the up tempo tunes don’t kill you with wonderment then her ballad singing will: “It Never Entered My Mind,” is a poignant ballad that McRae delivers ever so simply and yet the sculpting of her words makes one realize the multiple layers of irony present in seemingly simple combinations of consonants and vowels. It is my belief that no other studio album that McRae had recorded up to this time can even come close to “Live at Sugar Hill.” There is a particular kind of intimacy present here that her studio albums do not achieve. Perhaps having cut her teeth in clubs, McRae simply thrived on performing in front of a live audience. McRae, having watched and studied an intensely personal performer such as Billie Holiday, was most likely in her element. That’s what jazz was all about anyway, wasn’t it? Sharing stories, sad and tall, with folks who came out to hear and to experience such moments. McRae, as is evidenced by the album, would have made Holiday proud. 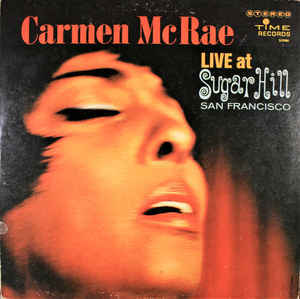 So back to the original question: What is Carmen McRae? If one takes the titles of “King” and “Queen” to be nothing more than job titles, a description of someone’s duties and responsibilities, then there could have been several “Queens of Jazz” operating at the same time and within neighboring domains, so to speak. Sarah Vaughn, Ella Fitzgerald and Carmen McRae each deserve the title and each more than ably fulfill the duties and responsibilities. Listen to “Live at Sugar Hill” and you’ll immediately hear that royalty was indeed in the club that night in 1963. This entry was posted on Sunday, October 28th, 2018 at 10:40 am	and is filed under Uncategorized. You can follow any responses to this entry through the RSS 2.0 feed. You can leave a response, or trackback from your own site.